Gold is an incredibly precious and valuable commodity, but in this story, it’s not the precious metal that has affected my life. Leaving behind one city of gold – Johannesburg – to make my life in another – Jerusalem – is quite symbolic. Egoli to Yerushalayim shel zahav – using the strong foundation of my past to build my future – gold on gold. What stronger possible building blocks could I wish to have.Now, I may not be living in Jerusalem yet, but there is a good chance that this magnificent, spiritual city is where I’ll end up eventually. Currently, I’m the wandering Jew – and I mean “wandering” in its literal sense. I’ve been living in the desert since I arrived two months ago, but I’ve spent only three weekends here. When I haven’t been studying Hebrew in ulpan, I’ve been travelling to Jerusalem and Tel Aviv and Be’er Sheva and back again.I’m living on a Kibbutz in the Negev desert, south of Be’er Sheva, the place in which you can find Abraham’s well among other historic sites. I’m attempting to learn Hebrew – although my mind is struggling to remember all the millions of words we’re learning each day – and enjoying the new friends I’ve made.Leaving South Africa was one of the hardest decisions I’ve had to make, mostly because of my family and friends, but also because of how much I love the country, the people and the experiences. Making Aliyah to Israel, however, was one of the easiest decisions I’ve made, even though it was a very recent one. Israel has always had a special place in my heart and when I was here in 2006, I fell in love, with Jerusalem, with Israel, with the people. I had never contemplated making Aliyah before, so most people were surprised, to say the least, after hearing about my move. And the fact that I was doing it so quickly had many of them astounded. But they all got used to the idea very quickly. I arrived in July, part of the fourth Aliyah flight from South Africa of that year, and the Jewish Agency put us all up for a night in Jerusalem. On our first afternoon, there was a special ceremony at the Kotel (Western Wall) for the olim chadashim (new immigrants) where we were given our new Israeli ID cards (which we need to carry as new citizens). I was one of two olim asked to make a speech at the ceremony. Not only was this a great honour, but it was also incredibly meaningful to be speaking at such a significant occasion – in my life and in that of nearly 150 other olim chadashim! With the Kotel behind me and a sign saying “Welcome home!” in front of me, it was a moment I’ll never forget. 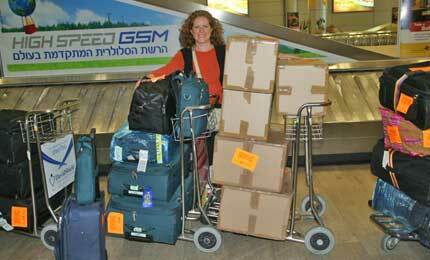 And from that moment on, the whirlwind that is my life in Israel began! The past two months have been really amazing. I thought I’d arrive in Israel, have a welcome ceremony in Jerusalem and then arrive on the Kibbutz in the desert for my six-month ulpan (intensive Hebrew learning). Instead, I’ve been on the Kibbutz, in Jerusalem, back on the Kibbutz, then in Tel Aviv for 10 days to cover the Maccabiah Games, then back to the desert, into Be’er Sheva a few times, back to Jerusalem and Tel Aviv, and even spent a few weekends “chilling” in the desert. It has been fun and exciting, but also extremely exhausting. Suitcases, suitcases, suitcases … the new immigrant at the airport. During my Maccabiah experience – I wrote articles and took photos for the Israel News Agency on what happens behind the scenes – we were taken on a trip to Sderot to speak to the Mayor about the Gaza war and the incessant rockets. He spoke about how the municipality is rebuilding the city and creating more parks to encourage the residents to spend time outdoors now that things are relatively calm. We were also taken to a heart-warming place in the desert called Aleh Negev. Similar to Selwyn Segal, it is a “village” that was started by the well-known and controversial Major General Doron Almag (you can Google him), whose son was born with a severe mental disability. The residents are all adults over 21 who don’t have anywhere else to go and it is a warm and loving environment with many health care workers and many volunteers who give selflessly of themselves. There is also a clinic and a rehabilitation centre, and children who are mentally ill or need rehabilitation and physical therapy are also welcomed. The highlight of Maccabiah Chai (18) was the closing ceremony. Not only did I get to run around freely as press taking photographs, but I got to meet President Shimon Peres and shake his hand. I’m sure he’ll never remember who I am, but it was an honour to have the opportunity. I can now boast having met three presidents – Peres, Thabo Mbeki, and most importantly, Nelson Mandela. Part of the Ulpan programme includes monthly excursions. Our first one was experiencing the Makhtesh Ramon in the Negev desert. This makhtesh (crater) is the largest in the Negev and is at the centre of two large nature reserves, Har Hanegev and Matsuk HaTsinim. Makhtesh Ramon is 40 kilometres long and nine kilometres at its widest point – and we walked the entire distance, ending up at a waterfall splashing into a pool surrounded by interesting fauna and flora. The hidden wonders of the desert are truly amazing. As you can see, I’ve had a very full and exciting two months with many interesting (and frustrating) adventures and wonderful, rewarding experiences. I’m sure my life here will eventually settle down into relative calm and normality (not that I know what that is), but definitely not in the next month or two. By the time you read this article, I will have been to Tel Aviv twice and Jerusalem over a five-day period. I will be covering an historic event for the Jewish Agency – nine Aliyah flights from Russia bringing in about 500 olim chadashim simultaneously. This auspicious occasion has drawn in the Minister of Absorption, Head of the Jewish Agency and many more, who will address the olim at a special ceremony in Jerusalem. I have also been asked to sit on a panel for Ashoka Israel, an international foundation that assists social entrepreneurs to succeed in their remarkable ventures. The organisation needed a third person to help choose the next Ashoka fellow and I was the only experienced panellist in Israel having sat on two panels in South Africa. And finally, I will be experiencing my first High Holy Days period in Jerusalem, the place that enticed me to Israel. Not only is it a beautiful city, but its spirituality and warmth, and its place in Judaism, keep me returning to feed my soul. The next six weeks till after Simchat Torah will certainly be hectic in my calendar, but I’m sure that after taking care of my work needs, learning the language of our homeland, and looking after my soul, I’ll return to the desert revived and ready for more wanderings and challenges. B’Shana Haba’ah B’Yerushalaim. I hope to see you all “Next year in Jerusalem” and I wish you all Shana Tovah and Chag Sameach.